Aero Precision Special Edition Freedom AR15 Stripped Lower Receiver features a custom engraved American Flag graphic on the magwell of the popular AR15 Gen 2 Lower Receiver. Markings Include Model "FREEDOM" and "4JULY-XXXX" serial number range. 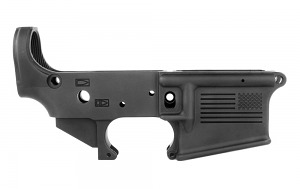 Like all of our receivers, this product is machined to mil-spec dimensions and works with standard AR15 components. Excellent lower reciever. Great service from Top Gun Supply. I'm a repeat customer.